A single Fike Micromist system is capable of protecting areas up to 9175 ft3 (260 m3), with a maximum ceiling height of 16’ (4.9m). The Micromist system is offered in 70 and 112 gallon (267 and 423 liter) configurations. Each system package is skid mounted and includes all necessary valves and actuation components for system operation. System nozzles must be ordered separately. Each Micromist system package is pre-assembled and tested to ensure system reliability and simplify installation. where the mist vaporizes and extinguishes the fire. The simple theory behind this development is that a large amount of small droplets have a greater surface area than the same volume of large droplets, therefore absorb more heat. Cooling- As the mist is converted into vapor it removes heat from the fire source. Wetting- Primarily for incidental class A fires; wetting of the surface helps extinguish the fire as well as contain it. Micromist systems are designed and have been tested for use in protecting flammable liquid (Class B) processes and incidental combustible (Class A) materials. 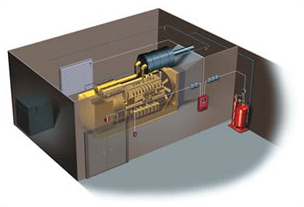 When a fire condition is detected in the protected hazard, the Cheetah/ Cheetah Xi control panel sends a signal to the releasing module to operate the Micromist suppression systems. The Micromist system contains nitrogen cylinder(s) and a water cylinder. 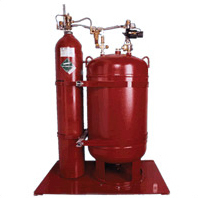 The nitrogen storage cylinder provides pressure to drive the water to the system nozzles. When the system is operated, valves on the nitrogen tanks open and the resulting air pressure flows through a pressure regulating valve (PRV) which regulates the pressure to 320 psi (22 Bar). This pressure drives the water through the opened water valve and to the system nozzles. The Micromist system uses relatively short pulses of water, called cycling, to aid in the extinguishment of fires as well as minimize the property damage associated with a continuous discharge. The Cheetah/Cheetah Xi control panel is equipped to handle the inputs and outputs required for operating the Micromist system. Factory Mutual Approved heat detectors shall be used in the protected hazard to activate the Micromist system. The piping requirements for the Micromist system offer the flexibility of copper tubing type K or L, stainless steel tubing or pipe as specified in NFPA 750. Due to the low flow requirements of the Micromist nozzle it is not mandatory that the piping be balanced, which improves system flexibility. Consult the Micromist Design, Installation, and Maintenance Manual (P/N 06-153) for detailed piping limitations. The Micromist system nozzles are constructed of brass and contain a nozzle screen to trap any debris that might be in the system piping. 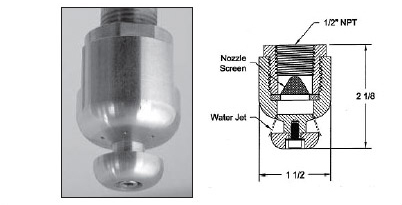 The nozzle utilizes a 1/2” (15mm) NPT port to connect to the piping network.